During fall break, I worked for the Laurel Steinhauser for State Rep campaign in Cromwell. My job for the weekend consisted of almost exclusively voter contact, which is the most important thing local campaigns like Laurels can do. 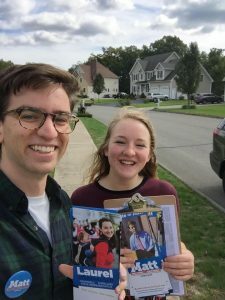 We would go out in canvassing shifts, going door to door talking to voters about Laurel and her opponent, talking through their policy differences and answering questions that the voters had. These person to person conversations are really effective in changing voters minds, and may seem intimidating at first, but become fun and very validating once you get some experience! My goal for break was to become more comfortable talking to voters and to become a more effective door knocker, as it is something that just comes with time and the best way to get better is to go out and do it. It made it easier because I was canvassing for such great candidates (Laurel and Matt Lesser – running for state senate), so finding more candidates like them in the future is another thing I am taking away from the experience, as it is much easier to get motivated to work hard for great candidates! My advice to someone who wants to get involved politically is just to find a local race that you think is interesting (i.e. good candidate, important race, important issue) and show up to help out. Local campaigns need all the help they can get, and your work will be greatly appreciated. Then, just keep showing up to help out, and when you do, you get the opportunity to work on more and more important parts of the campaign.